For some drivers getting insured for the first time, they aren’t sure how to renew car insurance. When a policy is close to expiring, you want to be certain you stay covered, without any gaps in your coverage. But how exactly does the process work? Does the policy renew itself, or do you need to keep track of the renewal every 6-12 months? In this article, you’ll get the answers to all of these pressing questions. It’s important to understand what requirements are in place for your policy, including when it expires. This way you have the best chances of locking down your plan without any coverage gaps. Thankfully, most policies have automatic insurance renewal. It means your policy will likely be renewed every 6 to 12 months unless you stop it. This way, you don’t have to stress about taking time to make sure it renews. If for some reason your plan needs to be canceled, or if it cannot be renewed automatically, the insurance agency will contact you via email or phone within 60 days before your plan expires. That way, you can decide whether to renew it or to continue with the cancellation. Remember, car insurance is an absolute requirement in the United States. Drivers use insurance for protection in the event of an accident. If you hit another driver and are not insured, you could be on the hook for thousands of dollars in damages. Having insurance gives you a better liability, meaning you won’t have to suffer the consequences of huge, out of pocket expenses. This is why it’s important to keep a current and reliable auto insurance plan. There are certain events which may prompt you to choose an auto ins policy that does not automatically renew. However, in most cases, it makes sense to select continuous renewal. If you do decide on canceling, all you have to do is make a quick call and terminate the policy. Serious moving violations – such as a DUI or DWI. Driving record patterns. Companies will view your driving history, usually every six months or less. They will look to see if the policyholder has had any serious violations. This includes accidents, speeding tickets, reckless driving charges or other violations that are too risky to insure. Some of these reasons can even result in a cancellation of the insurance plan. Remember, sometimes the hardest part about receiving a ticket isn’t the fine or the suspended license. Often, the penalty you can face from your insurance company can end up costing thousands of dollars, over several years. If you are feeling uncertain about whether or not your insurance plan will renew automatically, then contact your insurance carrier and speak with a representative. They will be able to give you renewing auto insurance advice over the phone. They can also assist you setting up an automatic billing plan. That way, your coverage will never get terminated, and you won’t suffer any gaps. 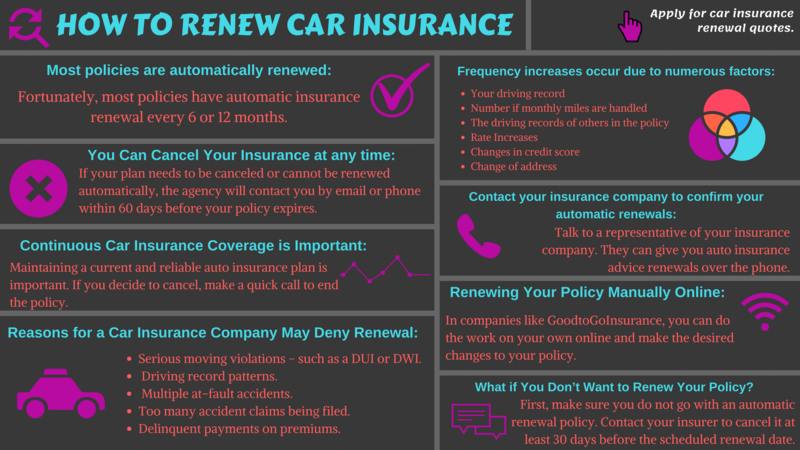 There are a few ways that you can renew your auto insurance policy manually as well. Most companies, like GoodtoGoInsurance, make it super easy to get the job done on your own. Although most policies are set to renew on their own, you can ask for a policy that allows you to renew it manually. You can do this online by logging into your insurance provider’s website and make the desired changes through the policy settings. Most car insurance companies provide some kind of online dashboard or portal where you can view your preferences and make changes. If you can’t find anything, be sure to contact the company by phone, email, or online chat right away. What if You Don’t Want to Renew Your Policy? In the event you aren’t looking to renew, perhaps because you are in pursuit or a new policy, you can cancel it yourself. However, the first step you want to take is ensuring that you don’t go with an automatic renewal policy to begin with. In this unique situation, your best bet is to contact the insurer right away. You want to do this at least 30 days before your policy is scheduled for renewal, if not more. If you accidentally missed your cancellation period, don’t worry. Most companies will still let you cancel your plan. However, you may be charged a fee for cancellation. If you have a lapse in coverage, you may end up seeing increased rates when you apply for car insurance renewal quotes. If you are a bad driver who has been involved in several at-fault accidents, then your insurance company may refuse to cover you at all, leaving you uninsured. In this case, the insurance company is refusing to continue doing business with you, since you are not a reliable driver and deemed high-risk. 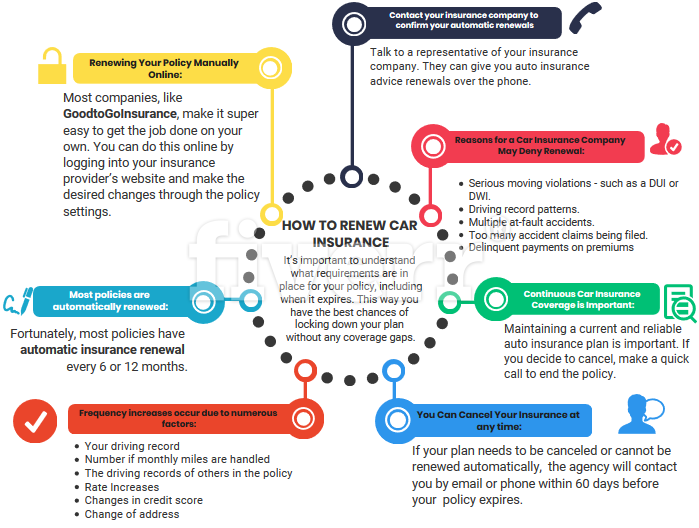 In general, you can rest assured that the majority of car insurance companies in the United States will automatically renew your policy, whether it’s a 6 or 12-month plan. If you are not scheduled for renewal, then the insurance company will let you know with plenty of time in advance. Most auto insurers offer a variety of payments. This includes automatic checking account debit, credit cards, Paypal and even Bitcoin. Now that you know how to renew car insurance, get a rate check-up. Apply now for free auto insurance comparison quotes from Good to Go Insurance Company. You can save hundreds by taking advantage of direct online pricing. Get a better plan today for less.